The work starts Monday for the new leader of the Baltimore City Police Department. BALTIMORE — Work starts Monday for the new leader of the Baltimore City Police Department. 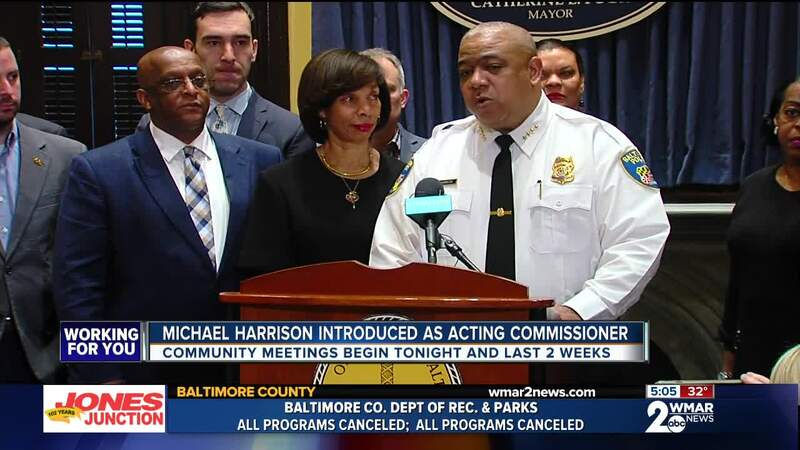 Michael Harrison is the former superintendent of the New Orleans Police Department, but, on Monday, Mayor Catherine Pugh formally introduced him as the Acting Baltimore Police Commissioner. “It’s an honor; it’s a privilege," Harrison said of his new opportunity in Baltimore. He said the task ahead represents the next "evolution" of his 28-year law enforcement career. He and his wife had settled into their new residence in the city in the past week. Harrison said he has been in daily communication with Interim Commissioner Gary Tuggle to learn what is going on in the the city and in the department, and to understand the rationale behind all the decisions the Tuggle made. His next steps will be getting to know the city better – it's police personnel, residents, business community, and history. “I want to thank the men and women of the Baltimore Police department," Harrison said. " … I am looking forward to working with you, working for you, advocating to get you all of the resources you need to be successful so that the Baltimore Police Department can be one of the great police departments in American policing." Harrison did not list his first order of business in the city, instead saying he needed to learn and hear more from stakeholders, citizens, and police officers to determine where he should first focus his attention. Chief among priorities for Harrison and the department is the continuing navigation and implementation of a federal consent decree meant to repair decades of fracture relationships between the police department and city residents. Harrison became the leader of the New Orleans Police Department in that city's second year under consent decree. He acknowledged it will take time to see changes, but his experience in the Crescent City shows a police department can make marked improvements. Within five years of taking over the NOPD, the department was "substantially compliant" in most metrics, Harrison said, "which is record time." Asked about sussing out corruption, Harrison was forceful about implementing strong policies and strict discipline, that could also adapt as best practices change. With more than 10 years of experience working in the Internal Affairs division in New Orleans, he also wants to ensure those same investigators in Baltimore are up to the task unit. While blatant corruption will obviously be targeted, a "culture change and changing the way officers think about decisions they make" will combat the softer, gray-area controversies that may not constitute corruption but can manifest into issues over time. Harrison's first visible actions in the city will be his attendance at nine scheduled community events taking place through two weeks, the first of which is scheduled for 7 p.m. at Forest Park High School in Northwest Baltimore. The Acting Commissioner will make his way through all nine city police districts, stopping in one a night through this week and into the next. "To the residents of Baltimore," Harrison said early in his remarks. "I’m eager to get to know you, to speak with you, to work with you to and engage with you to make sure we can build relationships that were never built, improve on good relationships, and certainly repair bad relationships because it will always be about relationships and it is the one way we will make Baltimore a great police department and make Baltimore a great city." Last week, Baltimore City's Board of Estimates approved a contract that includes a $275,000 starting salary for Harrison, making him the highest paid Baltimore City employee. Harrison's confirmation proceedings in City Council are scheduled to start next month.